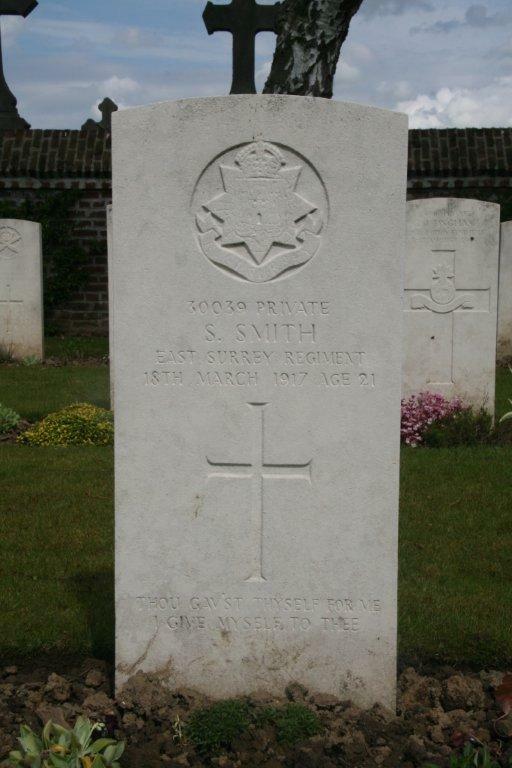 Stanley Smith (Lives profile) was the youngest child of William Shipp Smith and Ellen, nee Dench. His father was also a ringer, and quite a prolific conductor for the Surrey Association in its relatively early days, and was also a composer. William and Ellen married at Stephen’s, Twickenham, on 15 September 1889. William was then 22 and a carpenter, Ellen was the same age. They were both living at 6 Sandycoombe Road, just a short distance from the church. Ellen must already have been heavily pregnant as their first child, William Thomas Smith, was born less than a month later, on 8 October 1889. By the time he was baptised at St Mary’s Twickenham (the original parish church) on the family were living at the Mission House. The 1891 census tells us that this was on Church Lane, right next to St Mary’s. As the next property listed on the census returns was the Queen’s Head (now the Barmy Arms), this suggests the Mission House was perhaps on the site now occupied by the Mary Wallace Theatre. Shortly before the census Ellen Ethel Smith had arrived on 1 February 1891, she was baptised on census day, 5 April 1891, both the baptismal record and census entry agreeing on the Mission House as the family’s residence. The census lists Ellen’s mother, Mary A Dench as head of the household. She was a 65-year-old widow and a laundress. Her son (Ellen’s brother), Henry, a 40-year-old painter was also living in the household, along with William (still a carpenter), Ellen, and the two children. Based on later censuses, the birthplaces of Henry and William appear to have been accidentally switched, this census indicates that Henry was born in Paulerspury, Northamptonshire, and William in Twickenham, it seems far more likely that William was born in Paulerspury and Henry in Twickenham like his mother and sister and the two children. There’s at least one report of William ringing while in Twickenham (Bell News, 9 August 1890, p241 reports W Smith of Twickenham joining various visiting Surrey ringers on 19 July). The very common surname makes an exhaustive search extremely time consuming. There were also bells in Paulerspury, so he could have learnt to ring there. Some time in the next five years the family moved to Wimbledon. Stanley was born there on 14 January 1896, and baptised at Holy Trinity, South Wimbledon, on 22 February, the family’s address is recorded in the register as 121 Russell Road. Bell News suggests the move could have been as early as 1893 with reports then and in 1894 of W S Smith ringing at Wimbledon (18 July 1893, p201 reports ringing on 28 April 1893 and 14 May 1894, p113 reports ringing on various dates in April). Despite these early connections with the tower at Wimbledon, William seems to have been mostly associated with Mitcham, which had a strong band at this time, eventually becoming steeplekeeper. Since he was a carpenter he may also have been working for the ringing master there, J D Drewett, who ran a local building firm (he was also a local councillor and Master of the Surrey Association). By 1901 the family seem to have moved just next door, to 123 Russell Road (or there may have been some renumbering). William was still a carpenter, no occupation is given for any of the other family members, they still have Ellen’s mother living with them too. There also seems to be a second family (the Robins) living in the same house (and the same can be seen for all the nearby houses), so 9 people in total in the property. Sadly William Thomas Smith died in the first half of 1909, aged 19. I’ve not managed to find any details beyond the index entry for the death registration in the 2nd quarter of 1909 in the Kingston registration district. The 1911 census indicates that William and Ellen had had 3 children, one of whom had died, which was the first indication I found of the death of William Thomas. The family were then still at 123 Russell Road, now just the four of them (though there was still another household recorded at the same address too). William was still a carpenter, Ethel Ellen had become a female sorter in the Civil Service, possibly in the Saving Bank Department (“S Bank Dept” appears to be what’s recorded against her entry), Stanley was an assistant in a warehouse. Stanley did not rush to the colours at the outbreak of war. He enlisted, or rather was conscripted, on 30 August 1916. He made his attestation at Wimbledon, he was now a timekeeper, 5’6″ tall, weighed 122 pounds, and had a 36″ chest (with 3″ of expansion). He joined 4th Battalion, East Surrey Regiment. It seems likely that he had some time on Army Reserve B awaiting his call-up proper. He managed to ring his first (and only) quarter peal at Mitcham on 17 September 1917. After his training with 4th Battalion, he joined 9th Battalion, East Surrey Regiment in France, probably in early 1917. This was the battalion in which the playwright, R C Sherriff, was an officer. Transcripts of his letters home, which provide some insight into what the battalion faced can be found on Roland Wales’ website under R C Sherriff’s Letters from France. It was a cold winter, with a lot of snow. By March though the battalion were based in Cité Colonne, near Loos, where the front line went through small villages, so the men could find shelter in what was left of the houses. Early 1917 is also described in the book The Journey’s End battalion, the 9th East Surrey in the Great War. Stanley seems to have been rather unlucky, the battalion suffered only 5 deaths in March 1917, 3 of them were on 18 March, Herbert Lewis Reynolds and William John Woodall being killed with him on that day and Fred Cyril Benham died of wounds the following day. No particular mention is made in the war diary, except that the four men are listed as casualties of the 18 March in the appendix for the month. The brief obituary published in The Ringing World on 13 April 1917 states that he was killed instantly by a shell (though such reports have to be taken with a pinch of salt, those writing home often wishing to spare the families full details). Stanley was buried in Bully-Grenay Communal Cemetery, British Extension with Reynolds and Woodall either side of him. After the war the family had the inscription “Thou gav’st thyself for me, give myself to thee” added to his headstone, the last two lines of the hymn “Thy Life was giv’n for me”, words by Frances Ridley Havergal. The Mitcham ringers rang a half-muffled quarter peal of Stedman Triples in his memory on 1 April 1917, the band was A J Lambert 1, J D Drewett 2, C Dean 3, C W R Grimwood 4, A Calver 5, T Steers 6, W H Joiner (conductor) 7, J Currell 8. Calver and Joiner would also serve. TABLET UNVEILED IN THE BELFRY. They died that we might live. It is proposed to establish a fund in connection with the memorial, the money to be invested, and any interest that may accrue therefrom is to be used for the purpose of assisting any member of the Mitcham Society who may be in need of help. Unfortunately this does not seem to have survived, on a visit a few years ago I noticed that there are still large brackets on the wall that could have supported a marble tablet. On 6 September Ethel Ellen married Richard Pethybridge, a widower with children and 13 years her senior. He is probably the same as the R Pethybridge ringing with her father in the earliest reports of William ringing at Wimbledon. Ethel does not seem to have had any children of her own. The centenary of Stanley’s death was marked with a quarter peal of Yorkshire Surprise Major at Mitcham on 17 March 2017. This entry was posted in 9th Battalion, March 1917, Mitcham and tagged First World War, Mitcham, Stanley Smith on 18/03/2017 by davidunderdown95. Mitcham, St Peter and St Paul – including the black sheep of the association? St Peter and St Paul, Mitcham, sent seven ringers to war. Three of them did not return. Douglas Walter Drewett in particular was a major loss, the fourth-generation Drewett to have rung in the tower. He was the tower secretary at the time of his death, and his father, James Douglas Drewett, was the tower captain (and from 1913 the Master of the Surrey Association, also a local councillor, magistrate, churchwarden, governor of Mitcham School and owner of a large local building firm). James had also been one of the major supporters of the original formation of the Surrey Association. Although Douglas had a number of siblings, he seems to have been the only one of his generation who took up ringing, so when James died in 1928 in ended the family’s long association with ringing at Mitcham. Stanley Smith’s family did not have that length of association with the tower, his father William Shipp Smith was originally from Northamptonshire, but before the First World War was the steeplekeeper at Mitcham (responsible for the maintenance of the bells and their fittings). The family lived in Wimbledon, but as William was a carpenter, it seems possible that he worked for the Drewett’s building firm. It’s not known if the father of Benjamin Arthur Morris (the third casualty) was a ringer. Moving away form the casualties, I refer to the possibility of the Mitcham ringers including the black sheep of the association. Most of the surviving records show, if any black marks at all, very minor military offences against military discipline. The case of Sydney Amos Foster is rather different! He was one of seven siblings, two of whom died in infancy (sadly common still at the time). His father was a house painter. From the census records it seems that the Sydney and his siblings often lived with their aunt and uncle, James and Edith Emma Currell. In the 1911 census Sydney is shown as a 19-year-old labourer living with his aunt and uncle. By the time joined up on 31 August 1914 he was working as a bus conductor (perhaps helped by the fact that one of the ringers at Streatham was a very senior manager in the London General Omnibus Company). Though he appears to have initially signed up for the King’s Royal Rifle Corps, his training was with 8th Battalion, the Rifle Brigade. In March 1915 he transferred to the Army Ordnance Corps with whom his older brother, Albert Edward, was already serving (there seems to have been an Army Order allowing this sort of transfer to be with a relative). Even his initial Rifle Brigade service had been marred by a couple of disciplinary issues: he was AWOL 27-28 September 1914 for which he received 10 days confined to barracks, and on 5 March 1915 he was summarily convicted of refusing to obey an order for which he was demoted from acting corporal back to private. However, his offence with the Army Ordnance Corps was rather more grave. He was dishonourably discharged in July 1915 having been convicted at Winchester Police Court on a charge of the theft of government stores (31 blankets), and sentenced to two months imprisonment with hard labour. His record contains correspondence between senior officers complaining that it hardly seemed right that such a man should simply be discharged, when good men were fighting and dying in France. So possibly there was some official connivance when, shortly after being released from prison, he attested once again, on 9 November 1915. This time he went to a central London recruiting office, rather than a local office (where presumably he might have been recognised). He gave his parents’ address on this occasion, rather than his aunt and uncle’s, and his occupation as labourer (a criminal conviction would almost certainly have barred him from returning to work as a bus conductor anyway). He obviously realised that it would soon become obvious that he had previous military experience, so he stated that he had served with a Reserve Cavalry Regiment, and had been discharged as being “unlikely to become an efficient soldier”. I suspect that he would have claimed that his discharge was a result of failing riding training, which could still lead to discharge from a cavalry unit at this stage (later in the war such men would simply have been transferred to an infantry unit). He joined 11th Battalion, the Queen’s (Royal West Surrey Regiment). He was transferred to a reserve battalion, the 12th, on 10 March 1916. This was converted to 97th Battalion, Training Reserve on 1 September 1916. He was transferred to 18th Battalion on 9 December 1916 which was a Labour Battalion, these units were soon reorganised and he became a member of 3rd Infantry Labour Company, the Queen’s on 23 December, thence to 111th Labour Company, Labour Corps on 9 May 1918. His record during this period of service seems to have been clean. This might have something to do with the fact he married late in 1915 (presumably after re-enlisting as his next-of-kin was given as his father), and had a son in late 1916. It appears he died in early 1986, having been living in a nursing home in Hampton Hill. This entry was posted in Mitcham and tagged Bellringing, Benjamin Arthur Morris, Douglas Walter Drewett, First World War, Mitcham, Stanley Smith, Sydney Amos Foster on 16/01/2013 by davidunderdown95.